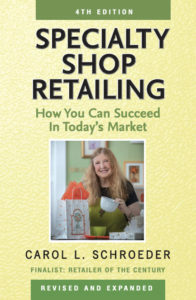 Bringing shoppers into your store should be the goal of all your promotional efforts — and if your promotion benefits a worthwhile organization at the same time, it’s a win-win situation! Yesterday we hosted an event in our store that raised $1,000 for scholarships for my alma mater, the U.W. Scandinavian Studies Department. And I’m happy to say that we had a busy day, with lots of happy shoppers. 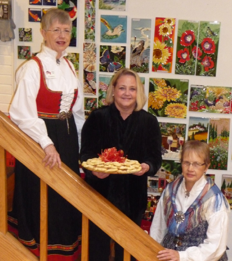 The bunad-clad hostesses from the Sons of Norway and fresh-baked Norwegian “berlinerkranse” cookies helped set a festive mood. And the book signing for Joan Peterson’s new culinary guide, Eat Smart in Norway, helped draw in customers and garnered us some free publicity. (I’m looking forward to doing a signing event in 2013 for Eat Smart in Denmark, which my daughter Katrina and I will be writing). 1.Ask your vendors and sales reps to donate items that fit with the theme of the event. 3.Set up a display of all the auction items where customers can see them and place their bid. Bidding can start a few days before actual special event. 4.Allow anyone bidding full retail value to pay for their item on the spot and take it with them. 5.After the close of the auction time, contact the winners and have them come back into the store to pick up and pay for their items. Tip: we had a number of customers wait for the Silent Auction to end so that they could be the high bidders. I’d suggest setting the ending time for a half hour before the store closes so that you have time to process these bids on the spot. I’ve posted a sample Silent Auction bid form for you online, as well as a peek at the full list of items we offered at yesterday’s event. By using Google Docs we were able to post a PDF of the list of items on our Facebook page and web site to allow for bidding via e-mail, although not many customers took us up on this. It’s important to get the full cooperation of the organization you are raising funds for in order to bring in those who are eager to participate in the Silent Auction because they support the cause. If these bidders are new to your store, they may well become regular customers in appreciation of what you are doing to benefit a cause they love.